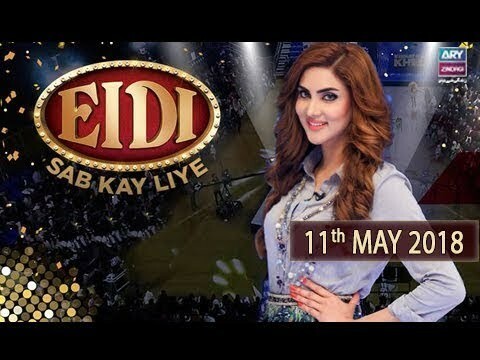 Eidi Sab Kay Liye - 11th May 2018 Eidi Sab Kay Liye is a game show hosted by Fiza Ali which is one of the most watched show of Ary Zindagi. Eidi Sab Kay Liye - 27th April 2018 Eidi Sab Kay Liye is a game show hosted by Fiza Ali which is one of the most watched show of Ary Zindagi. Eidi Sab Kay Liye - 21st April 2018 Eidi Sab Kay Liye is a game show hosted by Fiza Ali which is one of the most watched show of Ary Zindagi. Eidi Sab Kay Liye - 20th April 2018 Eidi Sab Kay Liye is a game show hosted by Fiza Ali which is one of the most watched show of Ary Zindagi. Eidi Sab Kay Liye - 14th April 2018 Eidi Sab Kay Liye is a game show hosted by Fiza Ali which is one of the most watched show of Ary Zindagi. Eidi Sab Kay Liye - 13th April 2018 Eidi Sab Kay Liye is a game show hosted by Fiza Ali which is one of the most watched show of Ary Zindagi. Eidi Sab Kay Liye - 7th April 2018 Eidi Sab Kay Liye is a game show hosted by Fiza Ali which is one of the most watched show of Ary Zindagi. Eidi Sab Kay Liye - 6th April 2018 Eidi Sab Kay Liye is a game show hosted by Fiza Ali which is one of the most watched show of Ary Zindagi. Eidi Sab Kay Liye - 31st March 2018 Eidi Sab Kay Liye is a game show hosted by Fiza Ali which is one of the most watched show of Ary Zindagi. Eidi Sab Kay Liye - 24th March 2018 Eidi Sab Kay Liye is a game show hosted by Fiza Ali which is one of the most watched show of Ary Zindagi. Eidi Sab Kay Liye - 23rd March 2018 Eidi Sab Kay Liye is a game show hosted by Fiza Ali which is one of the most watched show of Ary Zindagi. Eidi Sab Kay Liye - 17th March 2018 Eidi Sab Kay Liye is a game show hosted by Fiza Ali which is one of the most watched show of Ary Zindagi. Eidi Sab Kay Liye - 16th March 2018 Eidi Sab Kay Liye is a game show hosted by Fiza Ali which is one of the most watched show of Ary Zindagi. Eidi Sab Kay Liye - 10th March 2018 Eidi Sab Kay Liye is a game show hosted by Fiza Ali which is one of the most watched show of Ary Zindagi. Eidi Sab Kay Liye - 9th March 2018 Eidi Sab Kay Liye is a game show hosted by Fiza Ali which is one of the most watched show of Ary Zindagi. Eidi Sab Kay Liye - 3rd March 2018 Eidi Sab Kay Liye is a game show hosted by Fiza Ali which is one of the most watched show of Ary Zindagi. Eidi Sab Kay Liye - 23rd February 2018 Eidi Sab Kay Liye is a game show hosted by Fiza Ali which is one of the most watched show of Ary Zindagi. Eidi Sab Kay Liye - 17th February 2018 Eidi Sab Kay Liye is a game show hosted by Fiza Ali which is one of the most watched show of Ary Zindagi.